Are you ready to get away from the hustle and bustle of life? Come enjoy plenty of rest and relaxation when you choose to camp with this single-slide Cherokee travel trailer. There is plenty of room for your whole family from the private bedroom with wardrobes on either side of the queen bed to the rear set of double-size bunks. Enjoy dining, visiting, or playing games at the U-shaped dinette which can transform into an extra sleeping space at night. The rear bathroom features a tub where you can easily clean up after playing outdoors, and you will also find that this model features double entry doors for your convenience! 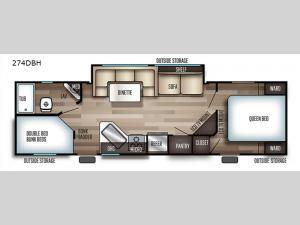 No matter which Cherokee model by Forest River you choose, you can rest assured knowing that each unit is built to provide you with great value, comfort, and style making it easy to get up and go as soon as the urge strikes. Each model features two-toned exterior metal and upgraded graphics, a one-piece rubber roof with 3/8" walkable roof decking, and a front stone guard for protection. Inside of each unit, you will enjoy comfortable seating and mocha-stained shaker-style cabinets. There are also a variety of optional packages available that will provide additional features, like the Base Camp Package, the Campfire Package, and the Limited Package. So when the open road calls, answer with your very own Cherokee travel trailer or toy hauler in tow!